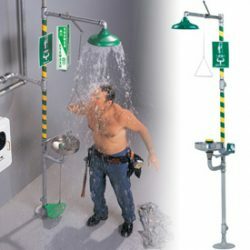 Abdullah Anti Fire Corporation’s safety products is the renowned leader in the safety products industry for Emergency Shower and Eyewash Solutions in Pakistan. With a rich history in Emergency Shower & Eyewash product advancement and technology, Abdullah Anti Fire Corporation continues to widen the uppermost quality products without cutting corners. Abdullah Anti Fire Corporation's use of heavier gauge piping and valve apparatus provides the user with the very greatest solution available. 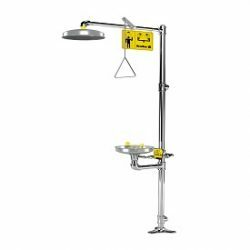 Our Combination Emergency Shower and Eyewash Equipment in Pakistan offer the user with both a full body saturation as well as localized orbital area coverage in single station. They feature self-determining, fully dispersed, flow patterns from the eyewash, face-wash, and shower heads. Abdullah Anti Fire Corporation's exceptional design also ensures that the flow of fluids is non-injurious; covering body and facial regions while utilizing varying hydraulic pressures from the water supply source. 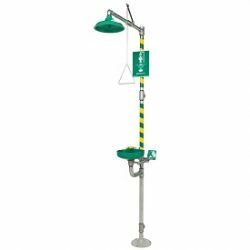 Standard Eyewash showers feature 20 GPM of water to irrigate and dilute full body exposures. Corrosion-resistant components meet a variety of applications. A wide range of accessories is available. Abdullah Anti Fire Corporation also offers vertical and horizontally mounted showers to fit your facilities requirements.